Looks up to Bucs defender. So who does the best defensive tackle in the game go to when trying to learn moves and techniques that might raise his game? The answer may surprise Bucs fans. One cool thing about the days preceding the Super Bowl is the Who’s Who of NFL players, coaches and suits appearing on various radio stations and TV shows that are rooted at the Mall of America’s food court radio row at the Super Bowl’s media center. One of those NFL types was the beast of the City of Angels known as Aaron Donald. The Rams defensive tackle ignites Bucs fans for some reason. Donald is a once-in-a-generation player. But the loud Gerald McCoy haters constantly look for reasons to pile on GMC for some unknown, deep-rooted reason, so mentioning Donald’s name seems to rattle their cages. Donald, this year’s NFL Defensive Player of the Year, essentially threw cold water if not reality into the faces of the GMC haters when he cited GMC as a standard for defensive tackle play. When appearing on “Pro Football Talk Live,” co-hosted by the great Mike Florio and former Bucs quarterback Chris Simms, which intelligent football fans enjoy weekday mornings on the NBC Sports Network, Simms asked Donald who he looks up to when trying to raise his game. Chris Simms: Who do you watch when you want to break down some film and see other guys at your position? Aaron Donald: You know, I’m breaking down McCoy. Whoa! So the best defensive tackle in the game monitors the same guy the haters want to run out of town? The same defensive tackle Donald studies to sharpen his game? Yet this same guy is not good enough for loud Bucs fans? Donald added if a successful move by GMC works, he wants to use that same technique. So, yeah, GMC is good enough for the best defensive tackle in the NFL to learn from but not good enough for some Bucs fans. Donald studies McCoy and McCoy studies Beyoncé!?!? Interesting! I don’t hate Mc, I only wish he were better; more like Donald. Mc is good, just underwhelming. GMC would be unstoppable if there was someone that actually helped him on the line. Dumbest fans in the NFL. These morons would have run Merlin Olson out of town on a donkey cart. I only wish he was more of a leader and held his teammates accountable. Bring back Bennett and watch McCoy light them up for a 10+ sack season. Yea, our 2 or 3 constant haters of McCoy who know more than the players and coaches who have to game plan against him. Get Vea next to him next year and watch McCoy show what he can do without being double teamed all game. And also a couple of defensive ends who do more than watch someone else make a play. Either get GMC some help or get rid of him. No point in paying a one D-lineman all that money and our pass rush still stinks. The McCoy haters should switch to watching volleyball or figure skating rather than displaying their ignorance here. McCoy is not perfect but who is? If these haters were the GM how would get someone better than him? Not going to be easy when he’s one of the best at his position on the planet. You cannot just have ONE great player on the D-line. If you do, offensive coordinators will figure out how to take him out of the game 90% of the time. McCoy needs his GM to provide LOTS of help. If we turn this position from a weakness into one of the strengths of the team you’ll see the Buc’s get into the playoffs. Nice catch Joe. Pretty telling. This is very telling Joe. I put alot more stock in this than the “Joe asked X coordinator about GMC” because those questions can tend to lead the person into what you what them to say. Additionally, while it is good to hear insight into what these ppl think of GMC, players/coaches tend to avoid bashing other players/coaches when asked like this. Donald bringing up GMC in an open ended question like that. Huge. What the hell is the Defensive MVP talking about? Didn’t he get the memo that GMC is a cancer? That because he plays on a Tampa team he can’t be any good? That he doesn’t get enough sacks? That he doesn’t elevate the rest of his D-Linemen to be the second coming of the Fearsome Foursome so he must be trash? That he can’t regularly beat triple teams? I mean, this is so obvious to everyone, right Tmax? What the hell does Aaron Donald know about playing D-Tackle, right Tmax? Lol Tmaxi……………..Aaron Donald just called you a complete idiotic, imbiecile! Lol AC! I won’t be back until after lunch but I will definitely be back. Aaron Donald ( a real stud) breaking GMC as added fuel to his fire by GMC silly remarks for his team NOT drafting him. Gmc was a doubter of Donald. Blew up in our faces. Here is something I just do not understand. Tmax trashes everything about the Bucs! Not just GMC but coaches…ownership…pointing out that no FA’s would ever want to come to Tampa and TMAX can tell them why. Again everybody is entitled to their opinions even if they’re moronic. But why does anybody come here if they hate the Bucs that much. We once had a secretary in our office whose husband rooted for the Patriots in football and the Yankees in baseball. What a freaking front runner!!! I tried to explain that Boston fan and NYC absolutely hate each other and he should pick a city and stick with it. He could be learning what not to do; and if a play works for McCoy, maybe he figures it will work for every DT. You need to answer those questions Joe. What you and many of the posters are not understanding is majority of mccoy’s critics do not bash his talent. They bash his drive, his competitveness, his leadership, his ability to raise the talent around him etc. Again, if you have the c on your chest and you let swaggy slack off in your meeting room then that is a problem. Yes mccoy is good but he is no dpoy candidate and he has lost a lot of respect from fans who are talking about things beyond just a swim move and get off. How about mccoy telling swaggy to get off the field if he is going to be lazy? Its not about talent that keeps mccoy from being embrased. Stop trying to make it about talent. Its about impact. @Drew so why didn’t he do it the first time Bennet was here? Donald SHOULD be in Tampa side by side with McCoy learning from him firsthand. Lovie wanted him. But McCoy told his coaches and the world that he wasn’t willing to take one for the team and move around the line if Donald was drafted. So we get an overpaid clown in McCoy who prefers to dance around and be friends with everybody, while getting washed out of the play 90% of the time…instead of the reigning DPOY and most dominant player in the league. Right on man. With Bucs fans wanting a winner but get guys like GMC shoved down our throats and post ” See, he is good” articles from cosigners. NOBODY GETS A PASS FOR A FAILED SEASON AND EXPECTIONS YET GMC AKA GARABAGE CAN LID GETS A PASS EVERY YEAR. But everyone around him gets cut or fired. Gtfoh GMC leadership is the problem. GMC is elite. So is Mike Evans. Of course Donald admires our Defnders. Who..that plays in the NFl would not? Hell, you can..have your way with them, pad your stats and get back on track against these Yucks. And besides, Didn’t the Bucs pass on Aaron Donald? But our leader of the 32nd defense loves watching Beyonce dancing for new dance moves!! tmax strangely silent on this one. Good points about GMC not being a ball busting leader and yes Swaggy should have been jerked aside early in the season. Coaches didn’t do it…players didn’t do it…until Swaggys boneheaded penalty at the end of the year. Kwon and Jameis finally went off!!! Those are the two leaders…Kwon and Jameis…not GMC or LVD. That’s fine…let Kwon and Jameis do the yelling as long as GMC and LVD continue to play at a high level I’m fine with different leaders. Donald is as close to a Sapp clone as there is out there. I still think last offseason the Bucs should have taken a run at trading for Donald when he was holding out. An interior defense of McCoy and Donald would have been devastating. I think for a couple of 1st the Bucs could have got it done if there was any real heat between Donald and the Rams – and he would have been completely worth it. Would you trade VH3 and OJ for Donald? I’d hate to lose OJ, but I’d make that trade faster than I can type yes, of course everyone with any brain would. I don’t understand why teams don’t go after proven guys like this. If you’re bashing McCoy you’re just a dolt who doesn’t know the game. Literally everyone that isn’t some keyboard warrior fruit says McCoy is a dominant player, including the people he plays against, yet you dummies think he’s no good because he’s not mean enough. GRRRRRRRR….Well just do me a favor and go down the Clearwater pier, then when you get to the end of the pier keep walking until you reach Texas. If you make it that far then turn south and head into Mexico, once there ask the first guy wearing a bandana and holding an AK where you can find El Chapo, just say your name is Sean Penn. Aaron Donald is a John Randle clone. They have the same size, speed, quickness, power And they get the same results, sacks, pressures while constantly beating double-teams. John Randle wasn’t drafted. But his brother (Erwin Randle) played LB for the Bucs for 6 seasons. His brother got him a tryout with the Bucs. The Bucs said he was too small for a D-Lineman. So they didn’t sign him, but Minnesota signed him. Side note: on the positive side Donald only has to study the first qrt of games. LakeLand – He’s more of a Sapp clone, him and Sapp are the height, they have a similar build with Donald being perhaps a bit more slim, but Sapp varied his weight from year to year depending on what he was trying to do that year, so he’d go between like 290 and 305 or so. To me Randle was a bit more of a stand-up player player, also in memory he looked like a bigger, I always thought Randle was like 6-4, but he’s listed at only 6-1. I think he just played against smaller guys so it made him look bigger. Anywho many people said Sapp was sort of a Randle clone, personally I didn’t see Sapp in that mold, but I do remember the comparisons back when Sapp was drafted before he became the gold standard. In either case Donald is clearly the next great DT in football and has been since his rookie season. Just checking to see the TMAXCON comments………….none yet? hhhmmmmmmm…….Did JOE ban / suspend him? Ever notice you never see Goodell and JOE in the same room at the same time? Yes, well said! I think McCoy is a generational talent like Donald. In Tampa, McCoy will always be compared to Sapp. His stats aren’t quite where Sapp was but he’s close. It’s not about the stats. It’s about the fact that #99, like him or not, would never ever let a guy like Swaggy half-step on his line. Coaches love a guy like Kwon who is not afraid to call out a guy that’s slacking. Coaches can demand accountability but it means little if the players don’t demand accountability from their peers. McCoy just isn’t that guy. I respect his skills but the C’s should go to Kwon and L David. Winston needs to earn it and McCoy just doesn’t have what it takes to lead. With your keen eye for talent…I know you’ve seen this kid out of Pitt. DT Aaron Donald 6-0½, 281 lbs. Sure the kid is small, but Wow. Your talking about an out of this world get off..smh. You add this kid to our rotation and look out. For a minute I was, like meh-next coming of Trevor Laws. Then the next minute…your speechless. Learn from McCoy? That’s funny. One is defensive player of the year, the other, well is Gerry McCoy. Don’t know why you keep trying to pimp McCoy Joe. Half of us think he’s an over rated blow hard, half think he’s the greatest D.T. of all time. It’s like trying to convince Trump lovers, and haters to change their minds about the greatest, or lousiest president of all time. ^^ I went on a 6 month campaign, raving about this kid. Imagine Aaron Donald playing next to Gerald McCoy! NO, the Bucs passed on him to get Mike Evans. AND they passed on Luke Kuechly! “And therein lies the rub” , Shakespeare. The Bucs has a 42 year old history of making dumb moves. This is the reason, why I’m always so down on them. 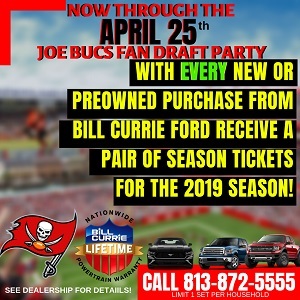 TheDailyCoroner – It’s very very difficult to say the Bucs made the wrong move on drafting Evans, he’s been one of the top WR’s in football since the moment he was drafted. Now Donald is THE best DT in football, but if the Bucs got Donald would they have kept McCoy? Remember Donald is playing with some great high picks on the d-line, that doesn’t take away from his greatness, but if he was in Tampa and teams game planned for him the way they do for McCoy, would he have been the defensive MVP? No. BUT if the Bucs had kept McCoy and had Donald, then wow, that would wreak havoc, but then on offense what the heck are the Bucs doing in 2016, starting Adam Humphries and Charles Sims at WR? I love Donald and think he’s great and I wish the Bucs had made a legit offer to try to get him last offseason when he was holding out, but I’m not sure I’d give up Evans because of the make-up of this team and how not having Evans would push back the development of Winston quite a bit. Again that’s not at all to take anything away from Donald. He’s one of the worst WRs I have ever seen in YAC. Julio Jones and Terrell Owens are the best I have ever seen. Great stuff tonight by Rod and LUV! Sup LUV!!! Hope all is good with ya. Me Ed, sad but true for the most part. Sad. McCoy is really good. I’m talking really good. Give the man some credit. Better yet, give him some outside help and see what happens……….quit throwing shade on GMC and be a true fan for once. @DB55 You couldn’t break down a POP WARNER game! With each comment you make you add fuel to your ineptitude, you are obviously a troll and you are a flake. Go back to who ever your team’s site is and have your fun. doesn’t matter who you are, if you are just one good guy the other team will erase you. in his entire career mccoy has never had a teammate on the D line who would make you pay for doubling him. to say mike evans was not a good selection just because better players exist in the league at his position stretches credibility. then again, the same is true of saying gerald mccoy was not a good draft pick but that doesn’t stop anybody. He averaged 1.6 YAC, even Todd Monken said it wasn’t nearly enough. My point is at 6’5 230 LBS, you can fall down and average 1.6 yard. And Julio Jones only played 49 games during his first 4 seasons. Mike Evans played 61 games. If ignorance is bliss, why do all the dumbest people on this site sound the angriest?